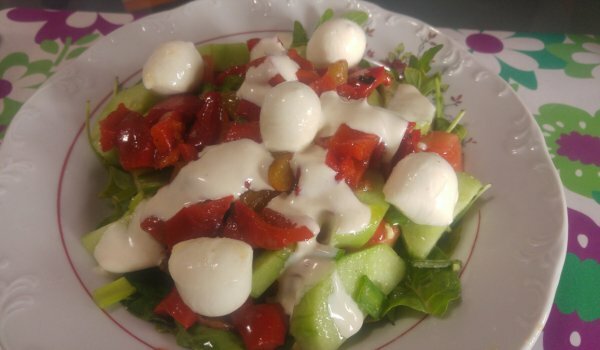 Rich salad for culinary and connoisseurs of delicious food. Let’s not forget that salad enters all kinds of diets and should not be rejected by any single person. Rich salad for culinary and connoisseurs of delicious food. In a deep dish, place the leaves on a rucola, and on it a baby spinach. Cut the tomato on the recipe, the cucumber – the half-moons, the green onion in circles and pepper. Arrange them in this sequence. Top with mini mozzarella, add salt and olive oil, and optionally add garlic and parmesan dressing. Place the baby spinach leaves in a deeper plate. 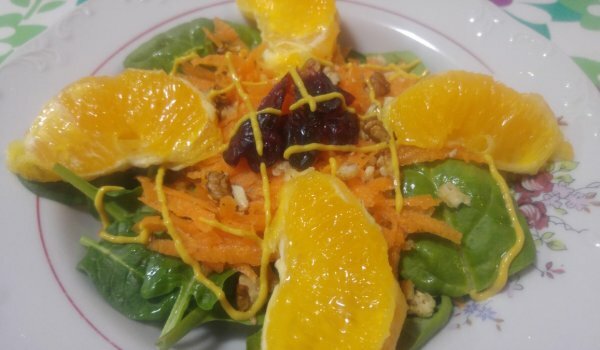 Grate a carrot and add it to the spinach. Break the walnuts and sprinkle. Add some dried cranberries in the middle, and pieces of orange. Finally, put the honey dressing.